The territory extends from Te Taumata-ō-Apanui (between Tōrere and Hāwai) to Pōtaka. The 13 hapū are situated along the narrow coastal strip between the Raukūmara Range and the eastern Bay of Plenty. Ko Te Whānau-ā-Apanui te iwi. Te Whānau-ā-Apanui is the tribe. 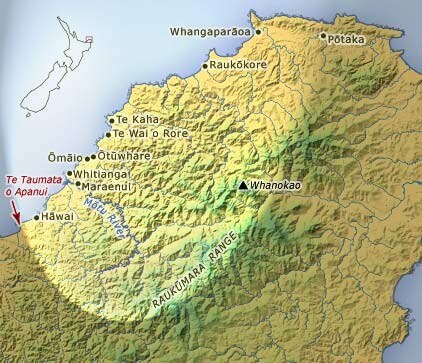 Whanokao Mountain is situated in the Raukūmara Range, south-east of Te Kaha, near the border between Te Whānau-ā-Apanui and Ngāti Porou tribal territory. The mouth of the Mōtū River is at Maraenui. Whakaari (White Island) continues to be significant to the people. Apanui Ringamutu: Te Whānau-ā-Apanui is named after the 17th-century ancestor, Apanui Ringamutu. (He was also known by the Ngāti Awa people as Apanui Te Haua and Apanui Te Kuti.) The tribe was named after him because of his ancestry and prestige. His father was Tūrīrangi, a direct descendant of Tamatekapua of Te Arawa and the Ngāriki people of the Tauira canoe. Rongomaihuatahi, Apanui’s mother, was a direct descendant of Porourangi, of Ngāti Porou. As a child. Apanui acquired land from both the Ngāti Porou and Ngāriki people.. Te Aotākaia, his uncle on his mother’s side, gave him land extending from Pōtikirua to Puketapu. Apanui’s father gave him land from Taumata-ō-Apanui to the Mōtū River. Later, Apanui won the land between the Mōtū River and Puketapu by conquest. Apanui Ringamutu had four wives and many children. His second wife, Whaaki of Ngāi Tai, was the mother of seven of his children. Whaaki’s sister, Te Kohepare, was Apanui’s third wife, and bore him five children. Kiritapu, his fourth wife, also had five children with him. Tūkākī: Tūkākī was the son of Apanui Ringamutu and his first wife Kahukuramihiata, of Ngāti Kahungunu. Many lines of descent converged on Tūkākī from Porourangi, Kahungunu, Toroa and Tamatekapua. These are depicted in four tukutuku panels near the corners of the meeting house called Tūkākī, at Te Kaha marae. Tūkākī married Te Rangiwhakapunea and had a number of children, including: Te Ehutu, who had the responsibility to uphold authority over the lands inherited from his father Kaiaio, a peaceful man known for his expertise in cultivating kūmara (sweet potatoes). Tamahae, remembered as the tribe’s greatest warrior, who fought many battles around the East Coast. He avenged the death of his grandmother, Kahukuramihiata, and travelled as far as Little Barrier Island to defeat the Ngāti Wai tribe. Apanui Waipapa of Ngāti Porou arranged for his daughter Rongomaihuatahi to marry Tūrīrangi, a descendant of Tamatekapua and Ngāriki from Tunapahore. However, war broke out between Apanui Waipapa and the Ūawa (Tolaga Bay) chief Kahukuranui, ending disastrously with Apanui Waipapa’s death. Later, Tūrīrangi killed several of Kahukuranui’s descendants near Tunapahore. The news of their deaths spread along the East Coast and reached Kahukuranui’s people at Tolaga Bay. Kahukuranui recruited a strong battle force and proceeded to Tunapahore to avenge the deaths. During their attack on Tūrīrangi’s pā, Kahukuranui was killed. Apanui Waipapa’s children showed their concern by sending their sister Rongomaihuatahi to the eastern Bay of Plenty, to find the man who had killed Kahukuranui. She and her escorts reached Tunapahore, where she met and eventually married Tūrīrangi. Their child, Apanui Ringamutu, was to become the founding ancestor of the tribe. Apanui Ringamutu meets his mother’s people Six or seven years after Rongomaihuatahi married Tūrīrangi, her brothers and the people of the Ngāti Porou region attended an important meeting at Ōmāio. On hearing of the meeting, Rongomaihuatahi set off along the coast from Tunapahore with her small son, Apanui Ringamutu. Reaching the creek behind the Ōmāio pā, Rongomaihuatahi instructed Apanui to continue while she watched from the bank of the creek. When the elders saw the boy playing with the children of Ngāti Porou, they asked them to bring him forward. In reply to their questions, Apanui told them that he was the son of Rongomaihuatahi. On hearing this, Te Aotākaia, Rongomaihuatahi’s brother, cried out a welcome that was echoed by the Ngāti Porou contingent. When Apanui said his mother would be arriving soon, everyone expressed their joy with greetings and weeping. Rongomaihuatahi then emerged from her hiding place and joined her people. To demonstrate his pleasure at the link between Tūrīrangi’s people and Rongomaihuatahi, her brother announced that the land between Pōtikirua and Puketapu would be given to the boy and his descendants. When Captain James Cook visited the shores of the East Coast in 1769, he noted numerous coastal settlements with intensive cultivations and heavily populated pā and settlements. However, early European settlers showed no desire for the land of Te Whānau-ā-Apanui. The region lacked deep-water harbours and was seen as too isolated to be economically viable. Among the first Europeans to visit New Zealand’s shores were whalers and traders. Some of the American, Norwegian and French whalers taught the local people how to catch whales. They also had large families with Māori women, and their descendants continue to live as members of Te Whānau-ā-Apanui. By the early 1900s whaling had become a major economic activity and cooperative enterprise for Te Whānau-ā-Apanui. Proceeds from the whale-oil harvest were devoted to community projects such as building meeting houses and churches. The last whale was killed at Te Kaha in 1924. The other main economic activity of the early 1900s was agriculture. Bush felling cleared the way for cattle and sheep stations, and small dairy farms. Dairying became well established when the Native Land Development Scheme was introduced. In 1925, Te Kaha opened its own dairy factory. William Swinton of Raukōkore was the first farmer to win the Ahuwhenua Lord Bledisloe Cup in 1932. Other Te Whānau-ā-Apanui people who won this cup were Swinton’s son William, and Tikirau Karehana. Many men left to fight in the Second World War, and some never returned; women also migrated during the war. Others moved to the city for better education and employment opportunities. By 1961, the East Coast road was improved and there was an upsurge of holiday visitors. During the 1980s dairying and other small-scale farming operations became uneconomic. Te Whānau-ā-Apanui were negatively affected by the privatisation of state assets. The loss of coach services when the railways were sold, and the closing of the Te Kaha post office had a significant impact on the community. As with other tribes, some people remained in the region to keep the home fires burning, while others moved away, or lived overseas. Since the early 1990s the tribal authority (Te Rūnanga o te Whānau) has successfully managed a fisheries operation. It has also become increasingly involved in social services and other economic developments. Many of the large, incorporated land blocks are planted with pine to be harvested before 2025, and there is investment in other industries. In 2001 the Cyberwaka rural community project began training students in information technology. In the 1991, 2001 and 2006 New Zealand censuses, residents of Māori descent were asked to indicate the tribe to which they were affiliated. The figures below show the number who indicated Te Whānau-ā-Apanui (including those who indicated more than one tribe), and the regions where they were found in the greatest numbers in 2013.